ABU DHABI, United Arab Emirates -- A license plate with nothing but the number "1" on it went for a record $14 million at a charity auction Saturday. Saeed Khouri, a member of a wealthy Abu Dhabi family, wouldn't say how many automobiles he owned or which of them might carry the record-breaking single-digit plate. "I bought it because it's the best number," said Khouri, whose family made its fortune in real estate. "I bought it because I want to be the best in the world." 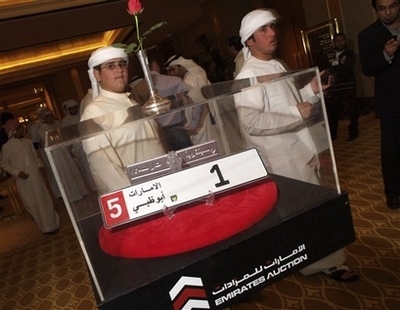 The oil-rich UAE began auctioning off vanity license plates last May. Ordinary automobile license plates issued to drivers here -- and even most other vanity series plates -- carry both Arabic and Western numerals and script, defining the issuing city and country. Khouri's plate, however, has only the Western numeral and no letters. The record sale surpassed the $6.8 million that was paid for an Emirati license plate at an earlier auction with the Western number 5 on it -- also without Arabic numerals or letters. Proceeds from the auctions, which are held in a lavish hotel here, go to a rehabilitation center for victims of traffic accidents. On Saturday, 90 license plates were auctioned off in all, raising a total of $24 million. The previous five such events raised more than $50 million.